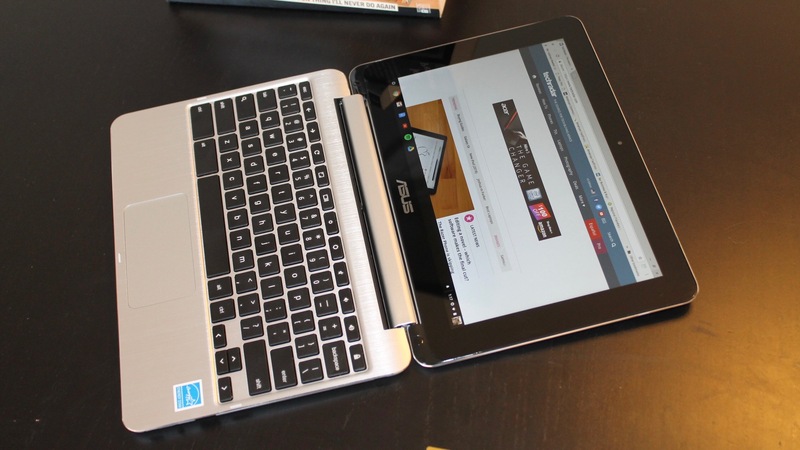 What it lacks in size, the Asus Chromebook Flip C101PA makes up for in names. It’s a mouthful, but at 1.9 pounds and under 11 inches in width, this Chromebook is not a bagful. That, plus its 12-hour, go-go battery are the C101PA’s best qualities. Unfortunately, there’s not much else to get excited about. Though a convertible, and relatively cheap, a finicky touchscreen makes the C101PA not a particularly great tablet, and a cramped keyboard makes it not a particularly great laptop. The C101PA has an identity problem. That said, it’s not without a market. The C101PA is a fine backup device, and a better-than-decent media ‘tabtop’ that isn’t afraid of trains and/or tiny dorm rooms. Its crossfit body and coupon-clipped, $269 (£289, about AU$349) price are what the C101PA puts at the top of its resume. The rest of this laptop&apos;s specs, however, are fairly standard for a budget Chromebook: 4GB of memory, 16GB of storage and a barely-HD screen. Decidedly non-standard is the C101PA’s processor. Rather than the Intel Celeron or Core i3 that’s ubiquitous in these laptops, the C101PA runs on a Rockchip OP1. A little research yields some clues as to why Asus went with the “rock”: the OP1 is very mobile-friendly – a better fit perhaps for the tablet-style C101PA. The C101PA’s closest competitor, the $249 (£170, AU$320) Acer Chromebook R11 shares its convertibility, as well as its small, barely-HD screen and 4GB of memory. Where the R11 differs from the C101PA is in its storage (32GB local) and processor (budget-standard Intel Celeron). It’s also, of course, a tad cheaper. The conventional – it’s just a laptop – $199 (about £229, AU$499) HP Chromebook 14 is older, larger and sharper (14-inch HD screen) than the C101PA, though the two are similarly kitted out on the storage and memory front. HP’s device also runs on – you guessed it – an Intel Celeron processor. With its silver finish and black bezel and keys, the C101PA is clearly MacBook inspired. That’s not a criticism necessarily – kudos to Asus for making a little Chromebook that looks just as stylish as Apple’s flagship laptop. As expected for a device that’s part tablet and needs finger-gripping room, the C101PA gives up much of its screen’s real estate to the previously-mentioned black bezel. Additional tactility is provided by the screen and back panel’s stiff construction. All this finger-friendly space has the unfortunate effect of making the C101PA’s small 10.1 inch screen appear even smaller. The bezel doesn’t just frame the screen, it swallows it up. 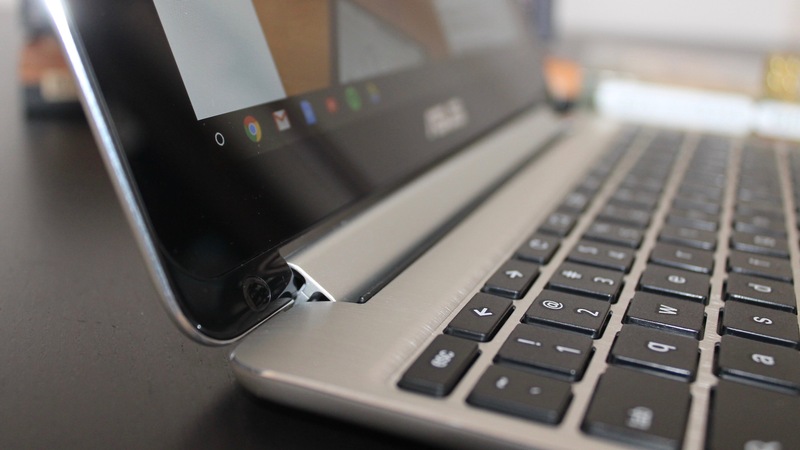 The C101PA’s full-flex hinge allows the Chromebook to execute its namesake: it flips smoothly, though not effortlessly, into tablet mode, and without any NASA-level mechanics, locks or funky twists. Because the C101PA simply rotates on its hinge, the keyboard in tablet mode awkwardly faces south, directly at your lap, table, or, most likely, hand. Manipulating the C101PA as a tablet feels like playing a saxophone – you’re going to get a fingerful of keys whenever you pick it up. It’s disconcerting but not disastrous – the keys turn off in tablet mode – though we wonder what effect this saxophone setup will have on the C101PA’s long term keyboard health. Also awkward is the C101PA’s supposed touchscreen. Finger scrolls and flicks work fine, but icon pressing, particularly small ones like a tab’s ‘X’ or browser’s ‘back’ arrow, is too often an exercise in futility. Be prepared for frustrated screen jabbing. At least its touchy touchscreen is clear and colorful with wide viewing angles – those essentials-for-a-tablet Asus got right. The C101PA’s touchpad isn’t given a lot of space, but it makes do. It swipes and scrolls as well as any device and has a springy, tactile ‘click’ that works all over the touchpad. This well-engineered usability helps the touchpad feel larger than it is. The same can’t be said for the C101PA’s keys: they’re small and feel as much. Neither their actuations nor the well in which they sit are particularly firm. The real estate they’re given is also sparse: your hands practically end up on top of each other as you type. An enterprise or school-ready device the C101PA is not. Apparently, going with the Rockchip was the right move for Asus, as the C101PA scored fairly well (for a budget device) on our benchmarks. The C101PA outperformed its Celeron-run rivals on both our Mozilla Kraken and Octane tests. While the C101PA’s scores aren’t impressive when put up against something like the Google Pixelbook, it’s not really a fair comparison. 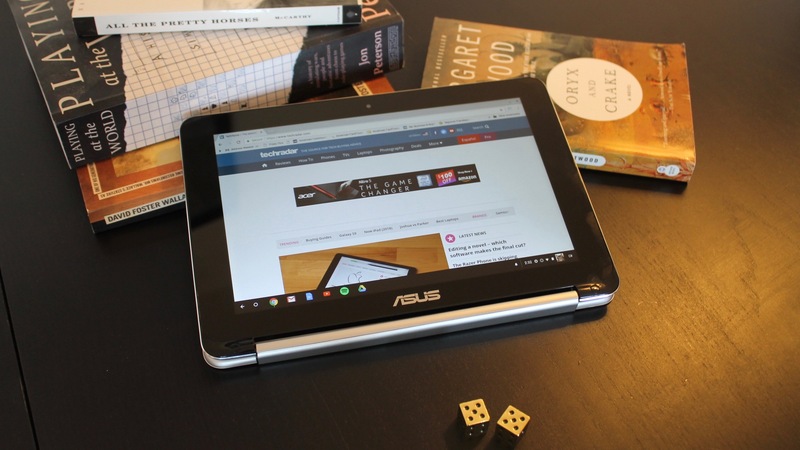 Asus’s little Chromebook is a quarter the price of Google’s top-of-the-liner. Our day to day usage backed up the benchmark scores: the C101PA ran cool with multiple tabs open and Spotify pumping music in the background. 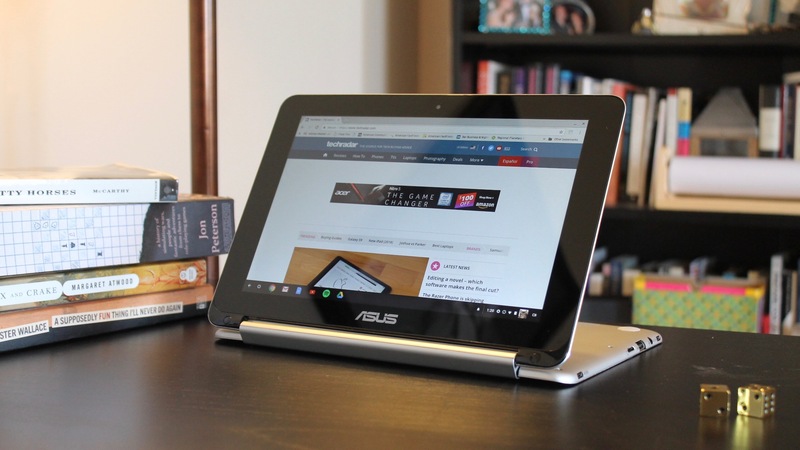 This Asus machine does what Chromebooks are expected to do (and nothing more): provide a solid device for light media and Internet browsing. Inside this pup of a Chromebook is one beast of a battery. This laptop turns out a half day’s worth of cordless action, outlasting the R11’s battery by three hours, and the HP Chromebook 14’s by six and a half. The battery inside is easily the highlight of this Chromebook. Its all-day battery is essential to the C101PA’s usability, and not because it’s a convertible. This Chromebook hates to be tethered. 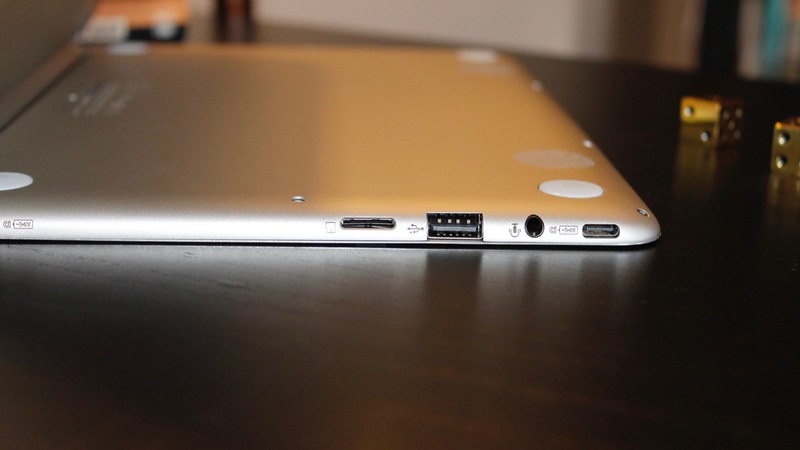 The placement of its power port near the front, rather than back of the device’s base effectively knocks six inches off the power cord’s length. Furthermore, its front plug forces you to play some positioning games with the C101PA while charging it, as the power cord will try to snake underneath the device’s base. All told, the C101PA is certainly affordable, it just isn’t as affordable as some of its competitors. Acer’s Chromebook R11 accomplishes the same tablet feats as the C101PA, but for a bit less. The HP Chromebook 14 has similar internals to Asus’s Chromebook, and while HP’s device isn&apos;t convertible, it is cheaper. When other devices do what the C101PA does, but for cheaper, it’s hard to see the value. That isn’t to say the C101PA isn’t without great features: it’s light, it runs smoothly and it has one hell of a battery. But, it doesn’t have a sharp screen. It doesn’t have a comfortable keyboard. It doesn’t have a precise touchscreen. These are the sorts of faults that can relegate a device to ‘backup’ or ‘my kid’s first computer’ or ‘the thing on my nightstand I use to google celebrities.’ The C101PA is a backup Googler. And, that’s not necessarily a bad thing. If you’re in the market for a secondary device, or a primary one that easily fits into a nightstand drawer, then check out the C101PA.